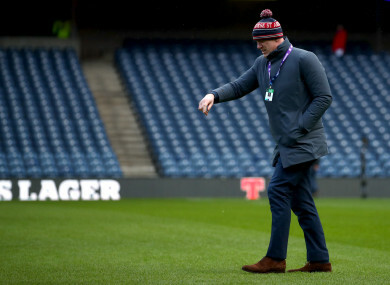 O'Connell on the field at Murrayfield before punditry duties with BBC. FORMER MUNSTER AND Ireland second row Paul O’Connell will reportedly leave his post with Top14 club Stade Francais at the end of the season, according to reports in France last night. The Limerick man took up responsibility for the Paris club’s line-out last summer, but RMC Sport report that he has announced his departure to the squad amid suggestions of a difference in opinion with ex-Springbok, Blue Bulls and Leicester coach Heyneke Meyer. O’Connell worked within the Ireland U20s setup last season under head coach Noel McNamara. The 2015 Bouclier de Brennus winners currently sit eighth in the Top14, just five points off the pace for the Barrages. RMC also report that Mike Prendergast will also move on after a year with Stade and is in advanced talks with Toulon, who are in search of a backs coach. Email “O'Connell set to end stint as forwards coach with Stade Francais”. Feedback on “O'Connell set to end stint as forwards coach with Stade Francais”.